With a number of data points in my hand it was time to give this gelatin mold thing a trial run. 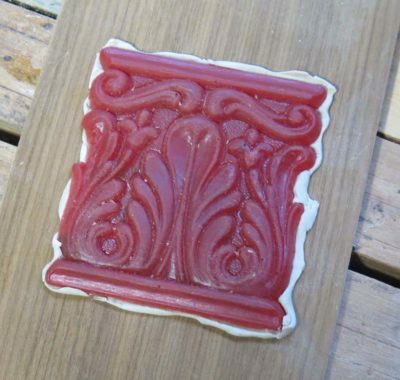 For the master pattern I selected one from my inventory of such things, an epoxy replica of a carved element. I first affixed the pattern to a flat board using sulfur-free modeling clay as my gasket and adhesive. 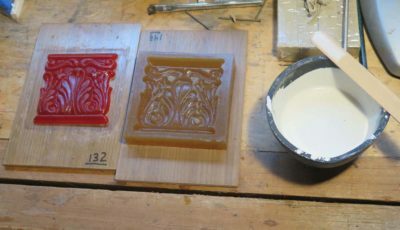 I have used this method as a rock-solid tried-and-true technique for decades, the sulfur-free aspect is critical whenever the mold-making material is silicon rubber (sulfur inhibits the silicon rubber from setting), and I just use this as my default for every similar application. 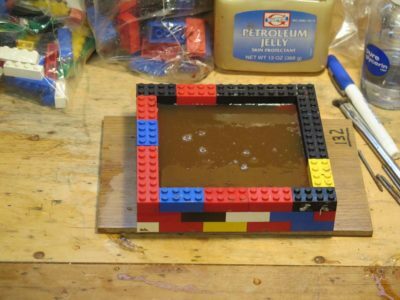 I cleaned off the excess and brushed the thinnest possible coating of petroleum jelly onto the pattern to assure perfect separation, then dammed the pattern with a rectangle of Lego blocks. For the gelatin mold material I used 192gws Standard glue, soaked overnight with the water level equal to the height of the glue in the glass jar. 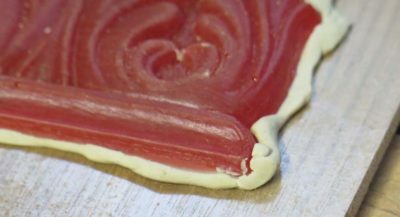 I wanted the gelatin to be on the viscous side, remembering that all the water going in has to come out and there are shrinkage issues to consider with that. 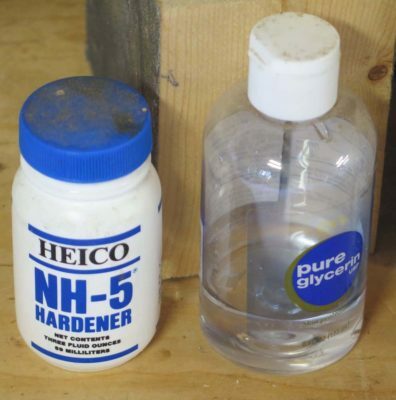 Once the glue was cooked and ready, I added 3% of glycerin to it to serve as a plasticizer followed by 2% protein hardener to crosslink the glue (both additions were by weight in proportion to the dry glue granules). 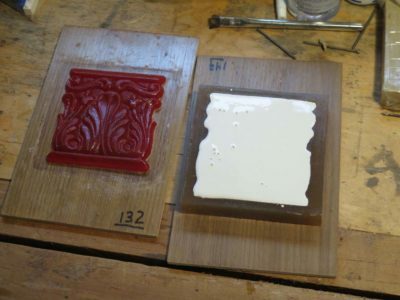 I had already learned to allow the glue to cool a bit before adding the hardener as higher temps make the crosslinking go too fast, turning the glue into an heterogeneous lumpy mixture. 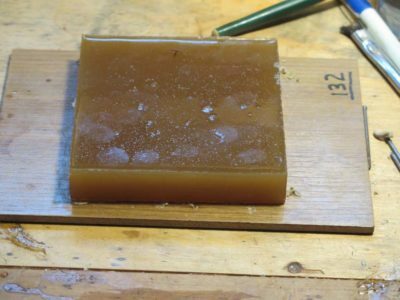 Once everything was ready I simply poured the glue over the pattern until it stood proud of the surface by about 3/8″ and set it aside overnight. The next day I dismantled the Lego dam and the rubbery block was just what I wanted, it peeled away from the pattern easily. Clearly the hardener was imparting toughness from the git-go and the glycerin enhanced the flexibility of the still-swollen block. 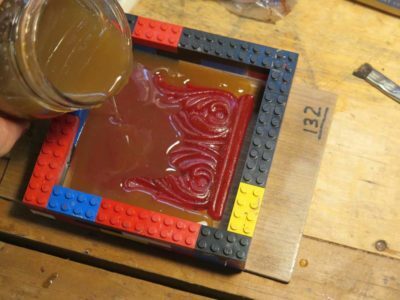 I whipped up a batch of plaster and poured it into the gelatin mold with outstanding results. 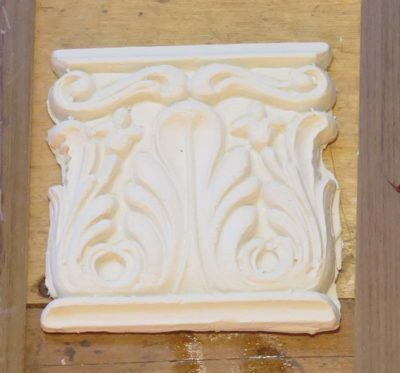 Well, as outstanding as I could have expected given my impatience, which caused me to de-mold the casting too soon. 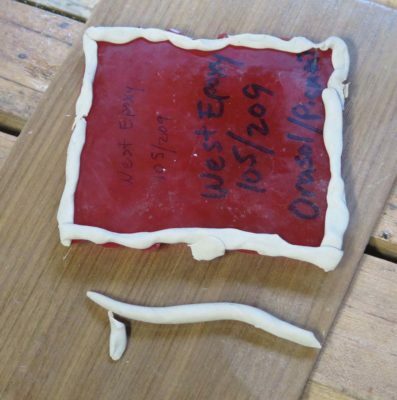 I should have waited 36 hours instead of 12; the high moisture content remaining in the gelatin mold retarded the setting of the plaster. 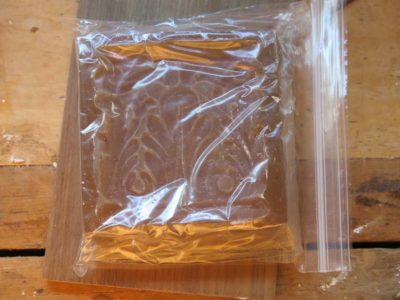 I immediately double bagged the gelatin mold to keep it from drying out, thinking the crosslinker would inhibit mold growth. Not so much. Two weeks later when I opened it to use it again it was something akin to a slimy special effect for a space alien movie. Still more territory for improvement on the next try.